If you will be in the vicinity of Kansas City on Friday, March 4, and Saturday, March 5, mark your calendars to attend this event. This is a terrific way to try their entire line of hand tools. Note: I have NO association with Lie-Nielsen Toolworks, other than being a happy customer. Lie-Nielsen at the Kansas City Woodworkers Guild. Remember: This is a FREE event! There is plenty of convenient parking at the Guild location. See you there! Disclaimer: I do not have any connection with Lie-Nielsen. As always, click on the images to enlarge them. It is now official: The first of the Events in the Midwest in 2010, the Lie-Nielsen (LN) Hand Tool Event is coming to Kansas City at the end of March! The Kansas City Woodworkers Guild will host the Event at their facility in Merriam, Kansas. You can view the brochure for this event by clicking on this link. Why would you want to attend? Sandy and I had an opportunity to take a mini-vacation. We slipped away to Cincinnati over the weekend, to attend the Lie-Nielsen Hand Tool Event at the Popular Woodworking magazine offices. On the way back we stopped in Hannibal, MO, on the banks of the Mississippi River, and played tourists for an entire morning. I converted a group of photos I snapped into a slide show, and then created a short video from that slide show. The show starts with one of two pairs of geese, and their babies, in front of the parking lot of F&W Media, the parent company to Popular Woodworking and Woodworking magazines. This was an amazing sight I had to share, as they allowed me to get very close. I was afraid one of the two parents would attack, so I gave them enough room. In our area this would be a very rare happening, as geese are much more shy, and guard their territory well. I hope readers don’t mind me posting this, and think it is a duplicate of the wonderful post by Bob Lang, Senior Editor, Popular Woodworking. Please consider this as the unofficial record of the event, and Bob’s THE OFFICIAL record (this is the link to his slide show). My thanks to everyone at Popular Woodworking for your hospitality! It was great to see and meet so many fellow woodworkers and hand tool manufacturers in one place over two days. I congratulate the folks at Popular Woodworking and Lie-Nielsen for putting together this event – Sandy and I enjoyed it immensely! I had a chance to meet Thomas Lie-Nielsen, and to chat with Deneb, Linda, and Mandy. You will see them in action in the slide show. 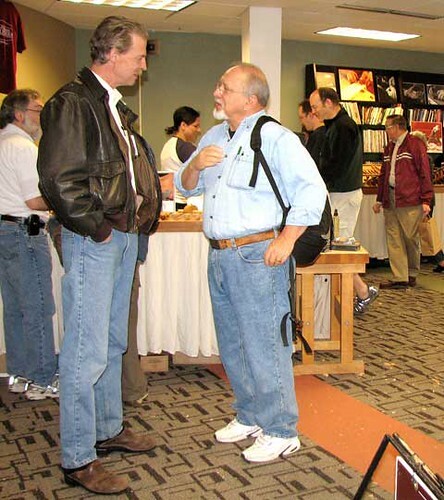 It was also great to visit at length with the other manufacturers at the event: Ron Hock, blade maker; Jameel Abraham, of Benchcrafted fame; Ron Brese, maker of exquisite infill planes; Bob Zajicek, maker of superb layout tools, and sponsor of my blog; Kevin Drake, of Glen-Drake Toolworks; and John Economaki, of Bridge City Tools. Of course, it was great to see Christopher Schwarz, Bob Lang, and Megan Fitzpatrick hard at work, too. Make sure to see all the bling on the window by the workbench where The Schwarz hangs out. You can’t miss the reflections from the flash. And Bob Lang was quite busy fitting tenons into mortises the entire weekend, when he was not taking photographs of others at the Event. Did you have a chance to attend the event? If you did, let me know what you found interesting. I, for one, hope it can happen somewhere in the Midwest, as driving 1,600 miles or more over the weekend was a challenge. But we did get some needed rest in Hannibal, MO, on the return trip.